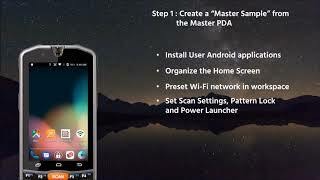 The Point Mobile PM66 is a very powerful rugged PDA with Qualcomm's Snapdragon MSM8916 processor. A quad-core with a speed of 1,4 GHz and a market proven application processor. It's a true SoC (System on a Chip) with 4G LTE, Wireless LAN, Bluetooth, S-GPS and Camera Bus Interface. More and more field workers require smartphone-like features in the field, but fast and accurate input through physical keys is required to increase productivity. The Point Mobile PM66 has a physical keyboard at the bottom of the 4.3" screen, making it still a slim, relatively small form factor against conventional "brick-style" mobile computers. Each key is wide and large enough for users to use the keys firmly, fast and accurate. LED-lit keys are easy to work at night. The Point Mobile PM66 runs on Google's latest Android 6.0.1 Marshmallow operating system and is certified by Google Mobile Services (GMS) to support all Google official APIs, including Google Play and Google Maps. The Point Mobile PM66 is equipped with a 4,3" IPS panel TFT LCD with capacitive touchscreen and supports wide viewing angle and sunlight readable (in bright sun) to maximize the best field performance. Using in severe conditions, the top of the screen is protected with Corning Gorilla Glass 3 tempered glass. The Point Mobile PM66 is slim and has a light yet rugged design with IP67 water and dust resistant and withstands 1.5 meter multi-drops on concrete. PM66 has various configurations, such as full 4G / LTE version for outfield and at the same time only a Wi-Fi version for warehouse / logistics applications. Wi-Fi only models can be connected to a gun grip with scan trigger handle. Therefore, it has been optimized for scan-intensive applications in warehouses.